So I got myself a shiny new Revan, immediately fully g12+'d and triple zeta'd, and have begun running him in squad arena along with the "standard" team: Bastila, GMY, Jolee, and GK. Jolee and GMY meditation are zeta'd as well. What I'm confused about is that Revan is widely reputed to be the anti-Traya, but I'm struggling to figure out how to beat a Traya team. The specific makeup is Triumvirate, Thrawn, and Sith Trooper. If I kill anybody other than Nihilus first, he ends up with a ludicrous amount of health from Lord of Hunger and I just can't kill him. And of course I start eating Annihilates and lose the war of attrition. If I do manage to kill Nihilus first, Sion inevitably ends up getting into Hatred and I can't kill and re-kill him fast enough to put him down for good. Again, time-out. And no matter who I choose, I end up getting my hits spread around when Marked drops because of the stupid Trooper. Between that and the massive crit avoidance from Traya, I just feel like I can't do enough damage to win. I'm sure there is a solution, I just can't seem to figure out what it is. Halp? I'm a fellow new Revan user. So hey! lol. Idk exactly but it might be strategy that needs to be tweaked. Idk. But to me it sounds like you might have a speed issue. What's your opponents speed (roughly. lol. Not exact numbers. Just a ballpark...) and what's your speeds? From what I hear you shouldn't hold back on speed for Revan. Put your fastest mods on him. I am using the same squads. GMY is my fastest character, so gets first and get the boosts up. After that I use direct focus on Traya. Jolee and Bastila call GMY to assist every time. Don’t kill Thrawn first. Direct focus on Traya to start. Kill her. Then kill Sion. Then I usually kill Thrawn, Sith Trooper and then DN last. Keep tenacity up on your toons as much as possible. Once you get rid of Traya it’s pretty easy to keep Nihilus stunned or ability blocked. Getting Traya's unique of the field first is very useful. You can still have some problems if DN builds up a big enough health pool though. Thrawn isn't much of a concern. No matter who he fractures you can work through it. I have only just unlocked him, but I understand that the team is a very mod specific team. Because Jolee / Bastilla and GK are relatively pillow fisted you are reliant on GMY and JKR to do the killing. I understand for this reason that Offense secondaries as well as humongous speed are mandatory on JKR and GMY to allow them to do their thing. Secondly, if you're mods are not perfect, you could consider removing a support for Ezra to give you that extra ezra's worth of killing. I always have a speed issue. I don't know how people have multiple teams fully decked out in 20+ speed mods, because I've been farming and slicing mods pretty much constantly for 6 months and I don't have a single mod with over 20 speed. I have one with 20, after slicing it to 6-dot, and it is on Revan. Anyway, my Revan is at 275 before his leadership. GMY is at 249, Bastila 215-ish, GK and Jolee around 185. I'm not sure what the other guy's speeds are but they don't seem to be super crazy fast. I may try that - my Ezra is only G10 with mostly trash mods currently, but I guess he's probably worth the investment anyway. Though the obvious choice to drop seems like Jolee, and I'm not sure how well everyone would be able to stay standing without him. Whilst I don't agree with everything he says I think he goes into enough detail to be helpful. Well, I just gave this a shot and it was ugly as sin, but I did manage to pull out a victory. I still had to kill Sion twice as he managed to get Hatred off just as Traya went down, and Nihilus as last man standing took a minute and a half on 4x auto to kill, but a win's a win. I’ve seen a few people at the top of my shard run Chewie on their Revan team. He puts guard on GMY and helps burn through characters like Nihilus a lot faster. Offense sets and primaries on GMY. You want his offense in the 6k range if you can get it there. Speed is important, but not as important as offense (6e offense square / triangle / cross with offense % secondaries on your arrow and wherever else you can get them - the secondaries bump up quite a bit once you 6e the mod). Since his main competition is other Revans and Traya, critical hits are either hard to come by (Traya leadership, GK crit immunity, Jolee in general) or have consequences you don't want (trigger a taunt, potentially on a tank with retribution who gains more protection for counter attacking than the damage he takes). It's ok to sacrifice some offense for speed. 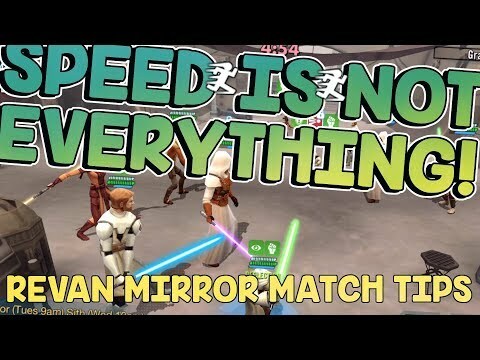 Speaking of speed, the rest of your toons are awfully slow for top end arena. Check out the mods on some of the teams in your top 50. You have to kiss a lot of frogs to find a prince in there, there's no shortcut, but it must be done. I wouldn’t auto against just Nihilus. He passes out health down and those abilities that call assists can give him more health than what damage you’re doing due to Traya lead. I mean yes, I understand how to search my mods. The issue is that I just don't have enough good speed mods. If I cannibalized ALL my other teams and didn't care about set bonuses, I might be able to get everyone on my arena team to 230 or so, but that still wouldn't get me into top 20 in my shard and would cripple my entire roster except for one team. As it is, I'm within striking distance of top 50, which is way better than where I was before Revan (200-500 bracket), so I'm not too stressed about it. If having trouble with Nihilus or Sion - remember that GMY's Battle Meditation gives Tenacity Up...which will almost always guarantee a resist on debuffs like Health Down and Fear. Even if Sion gets Held By Hatred, just pop Battle Meditation and kill him. Since he hasn't applied Painto any of the characters attacking him, his cooldown will still be over 10, and you just kill him a second time. And if your characters do have Pain on them (so are doing low damage to Sion), you have Bastilla assist, Revan turn swap, GK clear, and Strategic Advantage - all of which can wipe Pain off of Revan and GMY.